The Bundled Reed 1-1/4 in. Satin Nickel Raised Panel Knob is a beautiful accent to kitchen and bathroom cabinetry. The traditional design and finish add classic style to your home. Installation is easy and the necessary hardware is included. 1-1/4 Garrett Knob, 10 per pkg These Liberty 1-1/4 in. 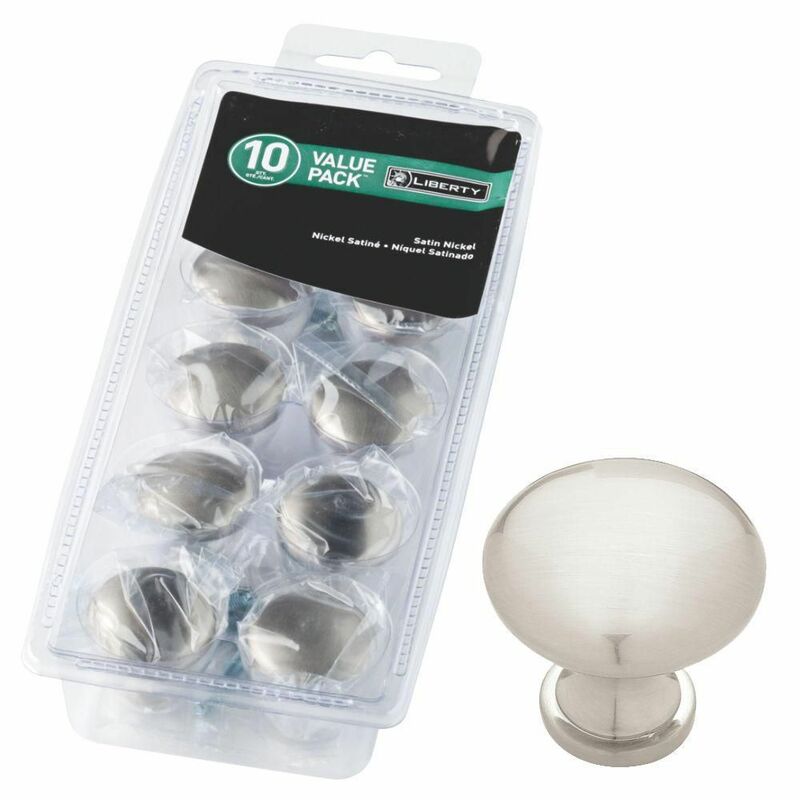 Satin Nickel Round Knobs (10-Pack) are ideal for use with a variety of cabinet styles and drawer fronts with a satin nickel finish that complements most styles of decor. The Satin Nickel finish on these knobs are sure to be enjoyed for years. 1-1/4 Garrett Knob, 10 per pkg is rated 4.7 out of 5 by 190. Rated 5 out of 5 by CoffeeLush from Nice and simple. Looks great in our remodeled bathroom!... Nice and simple. Looks great in our remodeled bathroom! Rated 5 out of 5 by Sheryl from The knobs look great and the price for the 10 pack was very reasonable. Definitely recommend. The knobs look great and the price for the 10 pack was very reasonable. Definitely recommend. Rated 3 out of 5 by HomeDepotCustomer from I really like the look and quality of the knob itself. However, not a single cabinet screw provi... I really like the look and quality of the knob itself. However, not a single cabinet screw provided in the packaging worked. I had to purchase cabinet screw separately as the existing ones did not work with the new knobs for either the drawers or the doors. Not one worked. Rated 5 out of 5 by Beef from We changed the knobs and handles on our kitchen cabinets and this minor change makes our 15+ year... We changed the knobs and handles on our kitchen cabinets and this minor change makes our 15+ year-old cabinets look like new! Classic and stylish look! Rated 5 out of 5 by Sparky from We purchased these knobs to try to match our builder's style and they were so close it was hard ... We purchased these knobs to try to match our builder's style and they were so close it was hard to tell the difference between the two.